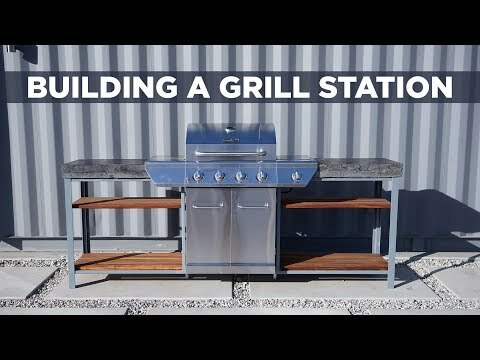 In this episode i take a stainless steel propane grill from Home Depot and build a grill station around it out of steel, concrete, and tropical hardwood decking. This will be the cornerstone of the outdoor kitchen at the container house i am building out in joshua tree california. We are still finishing up the construction on the shipping container house but those videos should be out soon. The frame is made out of 1″ square tube steel, 2″ x 2″ x 3/16″ steel angles, and 1″ steel angles. The concrete countertops is made out of Quikrete 5000 with a charcoal colored pigment added. The shelves are made out 1″by 5.5″ tropical hardwood deck board scraps that were left over from other projects. I get my tropical hardwood decking online from Advantage Lumber. Please make a pizza oven! Could you make something similar with threaded pipes if you don't have a welder? I want to make a auto tap if u can make it then i hope i will make it easily by seen it. The concrete with the dye in it has a really interesting look. Good job, Ben! Great work. FYI, from experience, paste wax does not do well outdoors. I think it’s because of the uv rays from the sun. would we gonna see that soon or not ? Welding and grinding is looking a lot cleaner since you first started welding. Cool to see the progress and learning along the way. I like the way you laid this project out. Good work. Another great project. Every one that you do at the container house makes me want to get started on my desert house. Just have to be patient. I like how you take on something without knowing exactly how to work it out. Then you just make it work. I appreciate that a lot.